It’s hard to forget ‘Marley & Me’, the heartwarming movie that revolves around an adorable, yet neurotic dog. It appears to have especially influenced Indians since the pet population increased dramatically after the movie’s release! The stats prove it too - on an average, around 6 lakh pets are adopted each year in India. While getting a pet home might elicit a lot many ‘oohs’ and ‘aahs’ of joy from animal lovers around you, turning your home into a ‘purr-fect’ sanctuary for your pet is another ballgame altogether. It is of utmost importance to create a pet-friendly home, and at the same time, ensure that you aren’t sacrificing on one that’s stylish and desirable. Is it possible to have the best of both worlds? Turns out… It is! Get Interiors That Pleases Your Love For A Beautiful Home and Pets! Here are some tips to design interiors that would please you, and also be ideal for your pet... and you can also jump to the end of this article for a visual guide of it all.... do download! Choose hardwood floorings like mahogany and oak. They exude a warm glow and do not stain easily. Laminate flooring, stone or ceramic tiles work well too. They also have the additional benefit of keeping your pets cooler during hot weather. 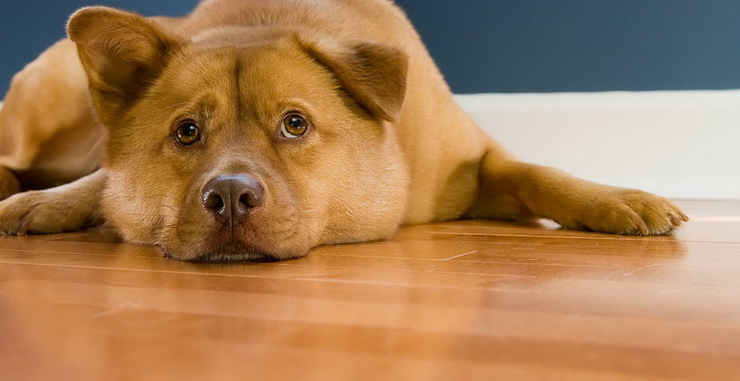 In addition to choosing a flooring type that is resistant to the damage pets may cause, it is important to ensure that it provides enough traction for the pets to move safely around the house, without hurting themselves. It makes sense to go for the type of flooring that is easy to clean as your pet might still be learning to toilet-train during the early months. On inevitable rainy days when your pup might be all muddy, easy to clean flooring will be a saviour. Your pets are energetic beings, and they need some designated place to chase balls, roll around excitedly and simply be themselves. A lot of times this is not possible around the house where you have breakables kept in different areas. A small play zone, which they can call their own and spend some quality time will go a long way. In case of metros where houses are not as spacious, having a separate play-pen may not be practically possible. In such a situation, you could designate a particular area for play for your pet, and train it to use that area alone. You cannot ignore the walls when you have pets roaming around the house. Textured walls will attract fur and will be a headache to clean. Opt for semi-gloss or satin paint over a flat finish. This will help even if your pampered pet decides to rub against any of the walls just because it feels like! Let’s try keeping the fur on the animal rather than on your super shiny walls! Unfortunately for our pets and our beautiful homes, they do not don a pair of slippers every time they want to get out and come into the house. You don’t want all the outside dirt coming into your home and wreaking havoc with your flooring. To avoid this, invest in a small mudroom at the entrance of your house. A small area where your pet can clean itself up before setting foot in the house. Stack it with some towels to wipe off dirt as well as dog treats, to let your furball know he is in for a treat if he patiently cleans up first and then run around the house as much as he wants to! Pro tip: Convert any small room near the entrance into the mudroom. This can also serve as your laundry room and a place which you can use for storage. In case of metro cities, where space is a problem, you could simply spread a mat near the entrance to your home, for your pet to rid itself of the dirt before stepping into the house. Anyone who has ever had a pet will know that they are as much a family member like others. Avoid using a dinghy pillow or rug as your pet’s resting area which will end up messing with your home’s interiors. Invest in pet furniture that gives good vibes and lets your pet know it has its bed! A pet bed made up of high-quality materials that will help them relax and unwind after their playtime. The one activity your pet will indulge in the most is probably peering out the windows. They are super curious beings and are always keeping an eye on visitor activity in your house. Not to mention how they wait all day to see their owner return home from work and just be with them! Don’t deny them this happiness by lining your windows with thick fabric curtains. Go for sheer fabrics that are lightweight and gives them a nice view of the outside scene. Let them bask in the natural sunshine pouring in through the windows. Sofas, rugs, bed linens are all prone to being stained by your pets. Leather can be a great choice but not if you have a cat - its sharp nails can spoil your furniture instantly. Opt for Ultrasuede or Crypton, a synthetic fabric that’s resistant to stains, smells, bacteria and muddy paws. Avoid velvet or corduroy as they are a magnet for pet hair. Also always choose machine washable fabrics for pillow covers, duvet covers etc. to help clean easy. Flaunt your love for your pet by matching the colour scheme of your interiors with that of your pet! This will not only make him/her feel at home but also save the day for you as it will end up hiding pet hair when you are too lazy to clean up the house! It is one of the fun ideas to help bring style to your home at the same time having a pet-friendly abode. A pet-friendly home calls for a spick and span kitchen that is inviting and feels healthy. Do not leave food bowls for your pets in open sight. Slide them underneath the toe kick of your kitchen cabinet and bring them out only during dinner time. You could also opt for a pull-out pet bowl that can be customised and hidden when not in use. Keep a water dish on the side of the kitchen to let your pup know there is fresh water available whenever he feels thirsty. Additionally, you could design a nook meant for your pet to relax or eat. Opt for higher shelves to store medicines and such other items, away from your pet's reach. Ensure that he/she cannot reach the hob (this is essential especially for cats who could easily jump on to a hot hob). In homes where space is an issue, it is ideal to keep pets away from the kitchen and find alternative areas for them in the other rooms of the house. It is no secret that cats love to perch atop tree branches. Get a piece of nature to your home with a wooden cat tree and help them feel home. 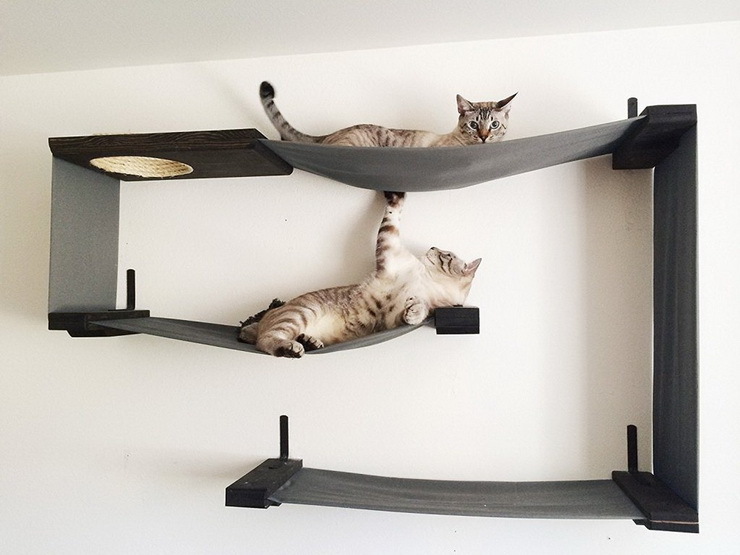 It will be a cute addition to your elegant house, and your furry friends have to never go out to climb trees! You could also opt for less intrusive, space-friendly designs like cat scratchers which can be placed in any one of the unused corners of your home. See! You will never have to choose any one out of your love for pets and your love for a beautiful home. Both can exist harmoniously! Speak to an Expert today who will help you build a super chic pet-friendly home! Newer PostWhy Getting An Online Interior Designer Makes Sense? Older PostAmazon vs Google: Exploring Their Radically Different Approaches To Workplace Design And How They Both Work!